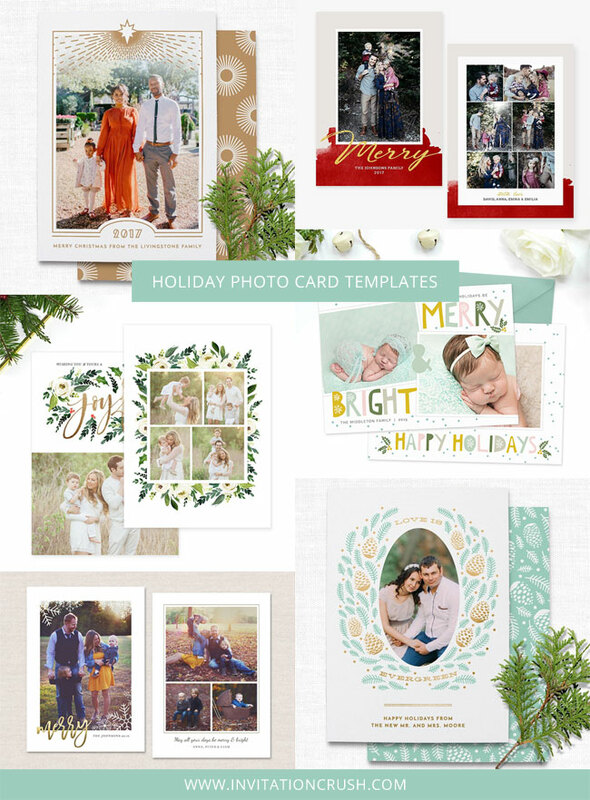 Holiday & Christmas photo card templates for photographers provide so many beautiful and creative options, not just for photographers but for anyone who wants to make DIY holiday holiday photo cards this season. One of the wonderful things about photo card templates is that they often offer a number of creative options in one design. For instance, you can easily customize the color scheme to coordinate with any photo and, in many newer designs, you can even find faux metallic (gold, silver, rose gold) options, in addition to standard color customization. This makes it even easier to create on trend designs for any personalized photo. Customizing colors is just one of the many creative possibilities that you have when you use holiday photo card templates. You can also customize text areas with details including your family name, the year, and your personal holiday greeting or message. In addition, you can use the layers in the Photoshop files (photo card templates are most often set up as layered PSD files for use with Photoshop) to your advantage by turning different layers on and off to meet the needs of yourself or your client. It’s easy peasy to turn off visibility on a text layer that you don’t need, for example. Holiday & Christmas photo card templates for photographers and do-it-yourself types are available in an endless variety of styles so, whether you prefer minimalist modern, typographic, brush lettered, watercolor, or floral themed designs, you’re sure to find something that you’ll absolutely love. Big holiday card trends this season include hand lettering, brush lettering, watercolor and brushstroke elements and backgrounds, watercolor florals and botanical designs, and foil accents, and there are so many beautiful holiday photo card templates that feature these styles. Using Christmas photo card templates makes is so easy, as a photographer, to build a stellar collection of beautiful designs that you can offer to your clients. And, if you’re a DIY – er, holiday card templates make it so easy to create your own, custom photo cards this holiday season. Be sure to check out this inspiration gallery of Holiday & Christmas Photo Card Templates for Photographers to see many more lovely designs. This post contains affiliate links. If you purchase through these links, you’ll help Invitation Crush (at no extra cost to you), and you’ll receive some lovely holiday card templates, too. Win, win! This post contains affiliate links. If you purchase through these links, you’ll help Invitation Crush (at no extra cost to you), and you’ll receive some beautiful gold foil holiday cards, too. Win, win! Gold foil Christmas cards have been one of the hottest holiday card trends over the past couple of seasons, and it’s no surprise that these shimmery, shiny, and sometimes glittery designs are a huge hit with people everywhere. Foil adds that extra something that can instantly take a good design to great, and it’s the perfect complement to custom family photos of all shapes and sizes. What’s not to love? There are other contenders in the world of foil Christmas cards – rose gold foil and silver are two very lovely options – but gold foil takes the prize. Gold foil Christmas cards bridge the gap between classic and modern, and the looks that are created cover a spectrum of styles, from minimalist to botanical to hand lettered and everything in between. The Minted community is filled with super talented, independent designers who, year after year, create some of the most beautiful holiday card designs around, and this year is certainly no exception. No matter your style, you can find the perfect holiday card in the Minted holiday card assortment, which includes luxe printing across a variety of formats, gold foil pressed cards included. They’ve also introduced glitter foil, which will appeal to anyone who loves a touch of glitter without the mess that can come along with it. The fantastic news is that Minted is currently offering all of us gold foil lovers a great deal with their Semi-Annual Free Foil Event! Enjoy 20% off all foil-pressed products with code SHINE17 now through November 13, 2017. 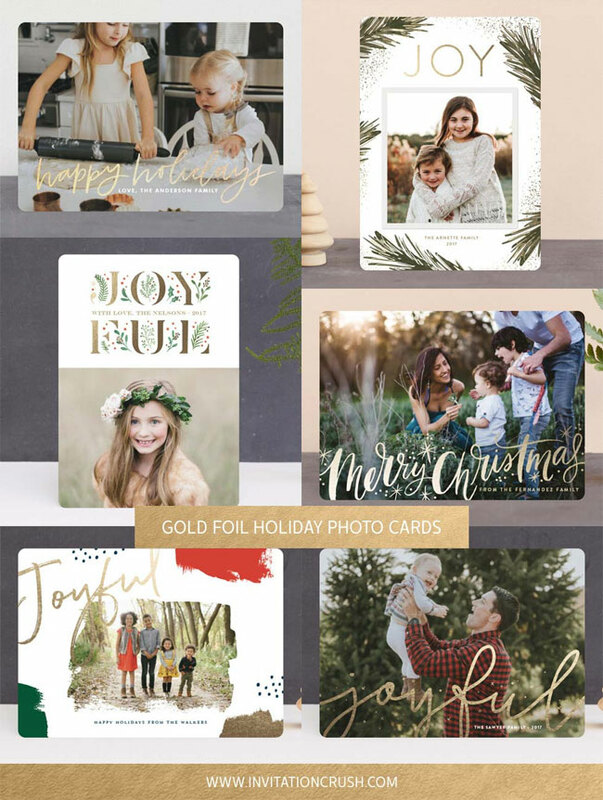 Below is just a tiny peek at the lineup of gold foil holiday Christmas cards in the Minted collection, and you can see even more in the Gold Foil Holiday Photo Cards inspiration gallery. Being blue isn’t necessarily a bad thing, especially when blue looks like these beautiful blue Christmas cards. Rich teal blue, navy blue, and cobalt blue are some of the hottest colors in 2017 holiday card trends, and these gorgeous hues are on display in a big way in this collection, which I’m calling “Blue Christmas”. Blue is a wonderful color choice for Christmas and holiday cards, as it signifies a cold and frosty time of the year (for us in the Northern Hemisphere, at least), a time when deep, dark, starry skies come early in the day. These deep, navy blue, dark teal, and cobalt tones are often paired with bright whites and gold or silver foil (or glitter foil), colors that can represent snow, which brings a delicate sparkle to everything it touches. Blue Christmas cards are also an excellent choice for non-Christmas holidays and, depending on the sentiment, can work wonderfully for Hanukkah or even New Year. Among these beauties, you’ll see some of the other hot trends in holiday cards this year, including painterly botanicals, dynamic hand lettering, watercolor textures, and foil stamping, all of which continue to be big trends in the larger world of paper goods and stationery. If you’re looking for lovely blue Christmas holiday photo cards with a color palette that stands out from the classic red & green, then you’ll definitely want to have a gander at these designs, which represent some of the best in holiday photo card design this season. This post contains affiliate links. If you purchase through these links, you’ll help Invitation Crush (at no extra cost to you), and you’ll receive some beautiful Blue Christmas cards, too. Win, win! If you love letterpress (and I most certainly do), then you are going to be very excited about one of the latest developments over at Minted. They just added a beautiful collection of letterpress save the dates to their assortment! I was so excited when they added letterpress wedding invitations to their assortment a little while back, and the addition of letterpress save the dates is just as exciting, if not moreso, because the lovely letterpress elements in the design can be mixed with your custom, non-letterpressed photo and customizable text. 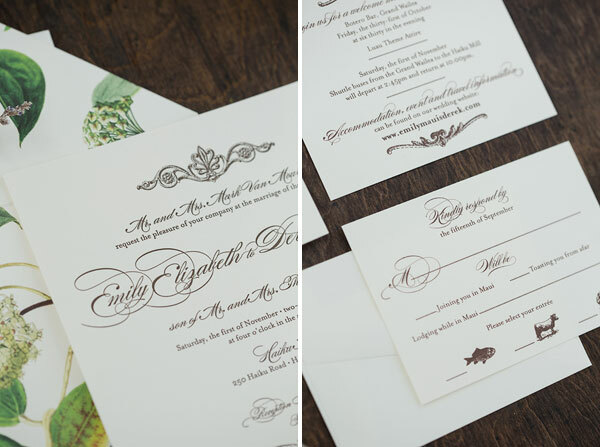 So, you get the luxe look and feel of letterpress plus fantastic customization options, too! 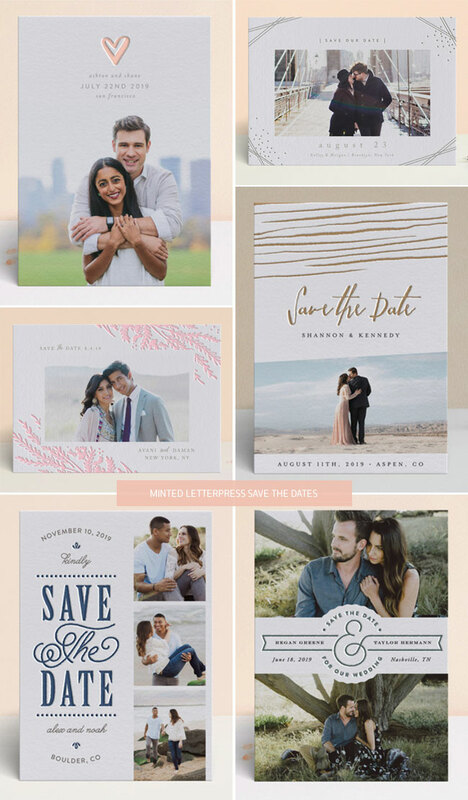 Below are just a few of the beautiful letterpress save the date designs available at Minted, and you can head over to their site to see all of the designs. This post contains affiliate links. If you purchase through these links, you’ll help Invitation Crush (at no extra cost to you), and you’ll receive some gorgeous, letterpress save the dates, too. Win, win! 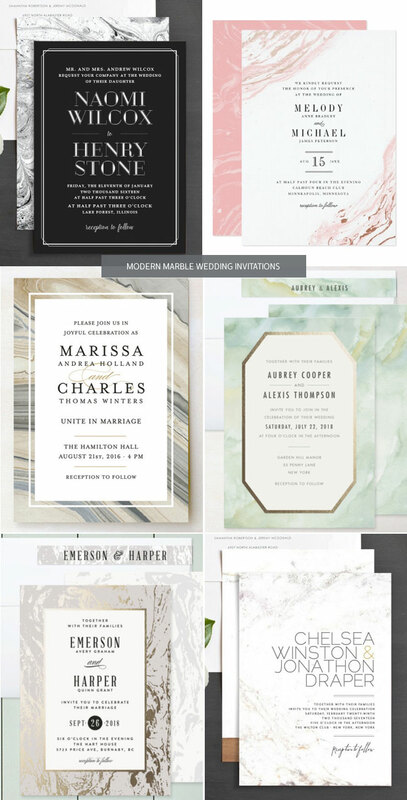 The marbleized look is still one of the hottest trends going in wedding invitation design, and these modern marble invite designs are beautiful examples of just how versatile marble-inspired wedding invitations can be. From soft pinks and mint greens to bold and classic black and white, you’ll find lovely choices all along the color spectrum! This post contains affiliate links. If you purchase through these links, you’ll help Invitation Crush, and you’ll receive some beautiful, marble-y wedding invites, too. Win, win! Today’s totally crushable wedding invites all have an angle and, boy, is that angle gorgeous! 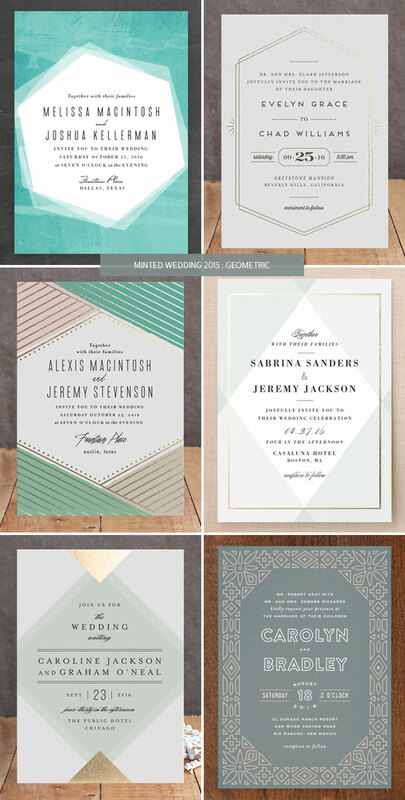 Geometric elements are another big trend in wedding stationery, and Minted’s new designs impeccably represent said trend with lovely lines, pretty polygons, and fabulous facets, as exemplified in the stunning Abstract Jewel invitations by Rebecca Bowen (above). 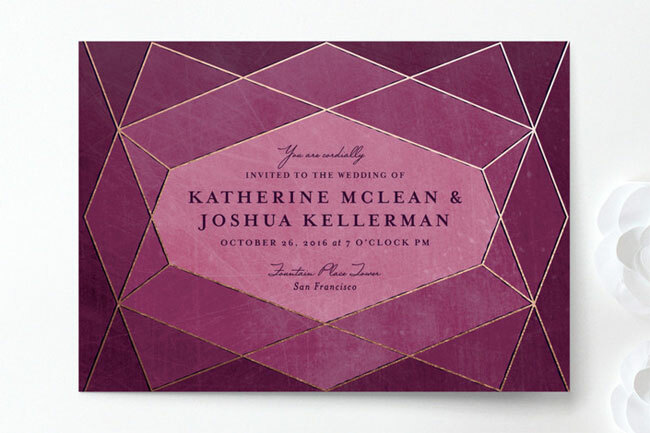 Let’s have a look at some of the other gorgeous geometric designs in the collection, shall we? This post contains affiliate links. If you purchase through these links, you’ll help Invitation Crush, and you’ll receive awesomely artistic wedding invitations, too. Win, win! 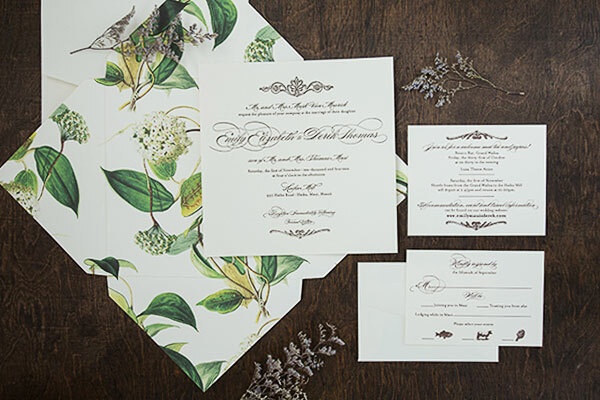 If you love beautiful botanical illustrations and classically elegant typography, then this custom wedding invitation suite for a Hawaiian wedding will have your heart going pitter-pat. The gorgeous suite was created by Jen Simpson Design for Emily and Derek, who were married at the equally gorgeous Haiku Sugar Mill in Hawaii this past November. Emily and Derek wanted their invitations to have a tropical feel without clichéd hibiscus flowers and tropical colors. We created a custom enclosure with a botanical print of the Hoya Pottsii, a plant native to Hawaii, to give the suite a local touch. We then designed the invitation in a semi-traditional layout with a rich script font to give the design some depth and added vintage ornament touches that are reminiscent of the sugar mill’s architecture. Emily knew that she wanted letterpress, and we had Boxcar Press print the invitations in a beautiful, rich coffee brown color. We flat printed the other pieces and had a custom printed Envelofold made by Envelopments to enclose the suite so, when her guests received their invitations, they would open up like little presents. 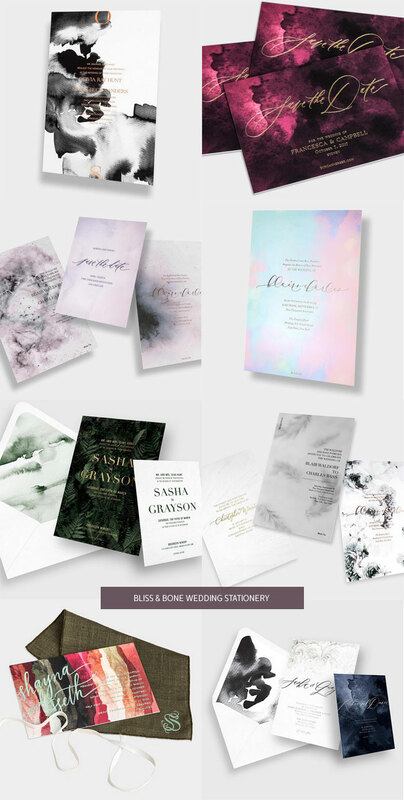 One of the mega hot trends in the world of wedding stationery right now is the abstract modern look, and Minted’s 2015 wedding invitation collection has some fantastic examples of this artful, dynamic style. A little brushstroke here, a colorful wash there, and tiny splatters everywhere add an ultra stylish touch to elegant wedding invites that are perfect for couples with a penchant for modern art. 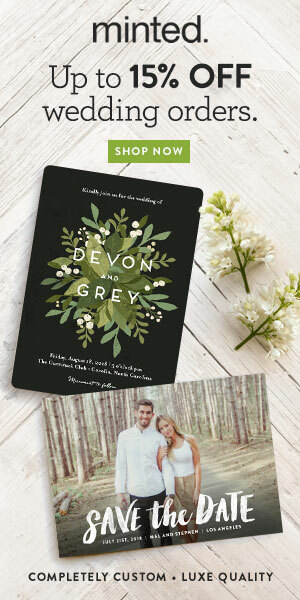 I’m in invitation lovers’ heaven right now because Minted just released their 2015 wedding invitation collection! The designers that are a part of the Minted community know how to create invitations that are the perfect blend of beautiful, trendsetting, and kickass, and over the next few weeks I’ll be featuring some of my favorites, as well as the new and ongoing trends that I’m seeing among the new crop of designs. Today, I’m all about the florals. I’ve said it before, and I’m sure that I’ll say it again: florals are always in style. 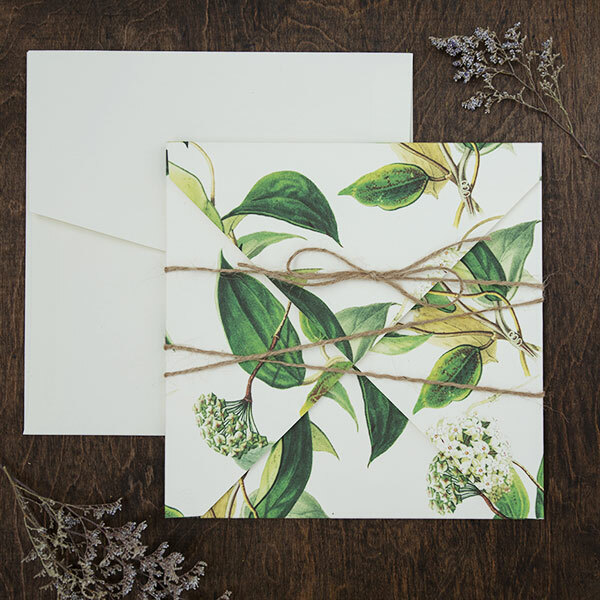 But I love seeing fresh takes on this classic motif and have spotted a number of lovely, floral-themed designs among the new Minted wedding invitations. Floral frames, particularly oval-shaped frames, are emerging as a big trend to watch, as are layered florals and stylized, watercolor, and handpainted floral sprays and bouquets. I’m also loving the deep, rich color palettes that we’re seeing. Shades of wine and burgundy, coral pink, poppy red, indigo, deep teal, and golden brown are popping up all over, and these gorgeous hues are just perfect paired with florals. This post contains affiliate links. If you purchase through these links, you’ll help Invitation Crush, and you’ll receive lovely floral wedding invitations, too. Win, win!